Personnel: J. Willgoose, Esq. (guitar/banjo/electronics) and Wrigglesworth (drums). Intelligence: Some bands seem to arrive fully-formed, with a unique sound from their first release. Such is the case with Public Service Broadcasting. With samples filched from newsreels and BFI films, frenetic guitar, twanged banjo and absolutely no lyrics, their distinctive sound is both musty and thrilling. And they're popular - it's becoming increasingly hard to tune into 6 Music without hearing them. “I've been playing since I was about 14, in various guises,” says frontman J. Willgoose Esq. (possibly not his real name). “I was working my way through various things that were either too indulgent or too long.” The inspiration for PSB came while listening to Radio 4 - surely the ultimate example of real public service broadcasting - one day. He started mining BFI films for samples, and was delighted when the institute gave their blessing. “The BFI have been absolutely fantastic to us from the first time I phoned them up," he says. "They were really supportive and accommodating. Studio Canal as well." With a brace of tunes in progress, it was time to go public. "I started playing live without any visuals. It seemed to go down well, but I had a slightly sort of scattershot approach. Then I started playing with Wrigglesworth [PSB's drummer - definitely not his real name] and the reaction increased. People started to seem to really enjoy it.” That was “around two years ago” and the band swiftly picked up management. “As soon as people with an actual plan came on board we started doing alright,” he says, ruefully. Wilgoose: Rickenbacker 330, Roland A300, Reaper, Countryman Banjo, Fender Jaguar, Nord Rack 2, Access Virus Snow, Yamaha CS6S, Native Instruments soft synths. 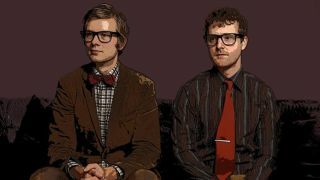 Check out the official Public Service Broadcasting website, follow them on Twitter or connect with them on Facebook. Inform - Educate - Entertain is released on 6th May 2013.